Some of H. P. Lovecraft’s most fascinating work came from a time in his life that he was forced, by economic survival, to ghostwrite, collaborate and revise the work of others in the field. Here Lovecraft scholar S.T. Joshi collects the best of these revisions and collaborations in a two-volume set to be published this year from Arcane Wisdom Press. 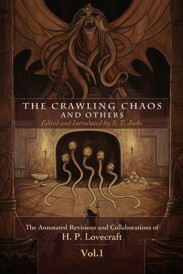 The Crawling Chaos and Others is the first of these two volumes. This edition is painstakingly annotated, and includes an introduction and bibliography by S.T. Joshi. The book is a must for the Lovecraft enthusiast and scholar alike. This limited edition hardcover will be strictly limited to only 150 hardcover copies. They will be signed by Lovecraftian scholar S.T. Joshi and will be hand numbered on a custom signature sheet, featuring artwork by Zach McCain. The Crawling Chaos and Others: The Annotated Revisions and Collaborations of H.P. Lovecraft, Volume 1. By H.P. Lovecraft; Edited, with an Introduction and Notes by S.T. Joshi. Welches, OR: Arcane Wisdom; 2011; hardcover; 418 pages. This book may be purchased in hardcover from Amazon.com or in paperback from Amazon.com or Barnes & Noble.